Helping to sort out the good from the bad in the gluten-free food world. Cinnamon buns at Sally's Gluten Free Bakery! Some of the best gluten-free cinnamon buns I've had in the past are not available in Atlanta and they can't be shipped here either. So it was uber exciting when I walked into the Alpharetta location of Sally's Gluten Free Bakery and saw a sign stating they had FRESH cinnamon buns available on Saturdays for a limited time! Even though I've had many, many gluten-free cinnamon buns that were not worth trying twice (some were not edible at all), I know that anything at Sally's is a good bet. I bought one of the nice sized individually packaged rolls and added it to my order of their delicious pound cake. As it turned out, I was going to a brunch in Greenville, SC the next day (Father's Day) and knew there wasn't any type of bread item I could have where we were going. When going somewhere nice like a wedding or country club, I like to put whatever food I'm taking into a small gift bag. No one knows you've brought food in until you pop it out and place whatever it is onto a plate. You don't go without dessert this way, and you also have a tasty treat in case there is a gluten-free dessert that you don't care to have (like ice cream, creme brulee or just fruit). Because it was Father's Day, the brunch fare was stepped up and included many more gluten-free dishes than the typical brunch there does. What a nice surprise! Even though I was quite full when everyone else went to pick out their desserts, I couldn't resist trying my special cinnamon bun from Sally's. Just the smell alone would drive any cinnamon lover wild, but the taste and texture of the bun was so amazing it was hard to take in. I shared the slightest little bit (only the outside part) with my husband and kept the ooey gooey part that was insanely delicious all to myself. So it was somewhat surprising when my husband commented that the cinnamon bun was the closest thing to his Mother's (gluten) version than he'd had in a long time. Actually, I could have cried at that moment as she is no longer with us. It's weird how food can affect some of us emotionally. I never thought I had an emotional connection to food.....then I was told I could never eat gluten again and found out I'd been wrong about that. It's extra special when you find something that's gluten-free that tastes as good as (or better) than the gluten version you remember from childhood or your wedding or whatever. 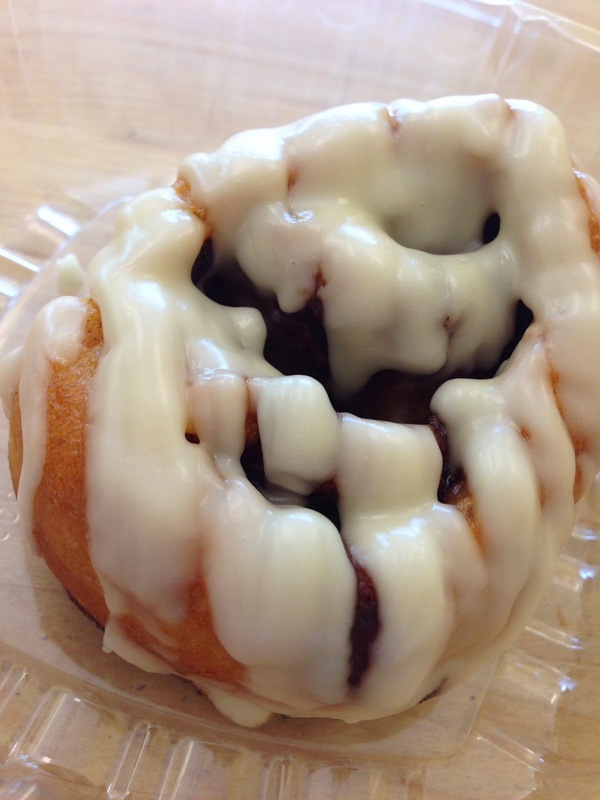 Sally's cinnamon buns are definitely special, but they're not available all the time. Be sure and check out his wonderful treat if you're living in the ATL while you can! It seems like every week a new restaurant in our area launches a gluten-free menu and while that used to be exciting, these days it's more important than ever to investigate these claims in detail. Lately, I've come across more places that don't have a clue about proper gluten-free service than those that do. EXAMPLE: There is a small independent cafe near us that has a sign on the counter noting that gluten-free pancakes and bread are available for a $1 upcharge. My husband was so excited to see this when he popped in to inquire about gluten-free dishes. When I called to ask more about these new items, I was nicely told that the pancakes - gluten and gluten-free - are all cooked on the same griddle. The bread for all sandwiches is toasted together as well. The person was fairly knowledgeable and commented that someone with a gluten allergy might want to avoid pancakes and toasted bread. They added that you can order a sandwich on un-toasted bread in order to ensure the (packaged) gluten-free bread would remain that way. Lastly, the person commented that since the gluten-free bread was stored in the refrigerator, the bread would be cold if ordered that way. Sounds yummy.....NOT! EXAMPLE: Large chain with a pretty extensive gluten-free menu has the most clueless staff I've encountered in a while. While a kitchen manager explained that the gluten-free pasta is cooked in clean pan/water, etc. which turned out not to be the case - at least on one of my visits there. After having gluten-free pasta dishes without incident a couple of times, I found gluten pasta mixed in with my gluten-free pasta. I sent the half eaten dish back - had it taken off our check - and asked to speak to the manager. He un-apologetically explained that anyone with a gluten allergy should not be ordering gluten-free pasta since it's cooked in the same water as the gluten pasta! Interesting.... OK - no reason to return there unless I want to order a salad. I certainly wouldn't trust them to prepare a burger with a gluten-free bun - or any other gluten-free specialty item for that matter! EXAMPLE: Multiple pizza places now have gluten-free pizza crusts. Many of them also serve gluten-free pasta (if they serve regular pasta). Some can explain what cross-contamination procedures are in place (for pizza and/or pasta dishes) and some can not. In fact, the question obviously throws the person on the other end of the phone - managers included - more often than not these days. At the end of the day, jumping on the gluten-free bandwagon can be quite profitable for restaurants when done right or wrong. Most of us know someone who's gluten-free for reasons unrelated to their health or food allergies. They're just following the latest fad and can not detect if they are glutened when dining out. The trendy gf-ers are kind of skewing the size of the gluten-free market which is somewhat positive when it comes to shopping for gluten-free specialty items. But it's detrimental when it comes to gluten-free dining options. It is clear to me that servers are encountering more faux gf-ers than those of us that will get sick if our food is not prepared/served correctly. And that is not good news for any of us. Always do your homework before trusting that any place you haven't been before knows what they are doing in terms of gluten-free service. I eat out at least weekly (daily when on vacation) and will continue to do so. It's great that there are so many places that do get it right. But I also feel like it's more important than ever to investigate whether or not a place is worth eating at BEFORE you get there. Like it or not, trendy gf-ers are driving the gluten-free dining market currently more than those of us who have no choice but to eat gluten-free. *The names of the places mentioned above are not listed because they could have changed their policies by now (or at any time) and also because there are way more of them out there than I personally know about. What I encountered could happen anywhere to anyone and it's up to each individual to make their own decisions about where to dine out. This post is simply a word (or many words) of caution about dining out. The restaurants on this list are not in any particular order. Some places I get to more often than others, but I've not had a bad experience at any of them. These are my favorite places and might not suit everyone else's tastes - of course. The food and drinks listed are items I've personally had which is not every gluten-free item each place offers. As always, it's the responsibility of each gluten-free patron to choose wisely when eating out. Bon Appétit! Food trucks have been popular for a while now, but honestly, I live in the burbs and rarely had a chance to check out the gluten-free options at the moving feast roaming the streets of Atlanta. So I was super excited to find out that my new neighborhood has a food truck alley on Thursday nights! At the event we attended, there were three food trucks that had various gluten-free options and a BBQ restaurant tent with many meat options as well. Below are some gf friendly trucks (far from a comprehensive list) in the ATL. To learn more about Alpharetta's Food Truck Alley nights, please check out this website. The trucks for each week are listed on Monday or Tuesday for that week's event on their FB page. It was pleasantly cool during our visit to this fun event (due to a rainstorm earlier that evening) so none of us were jazzed about having a frozen pop from the King of Pops. (Plus, we can get their fabulous treats at Whole Foods). 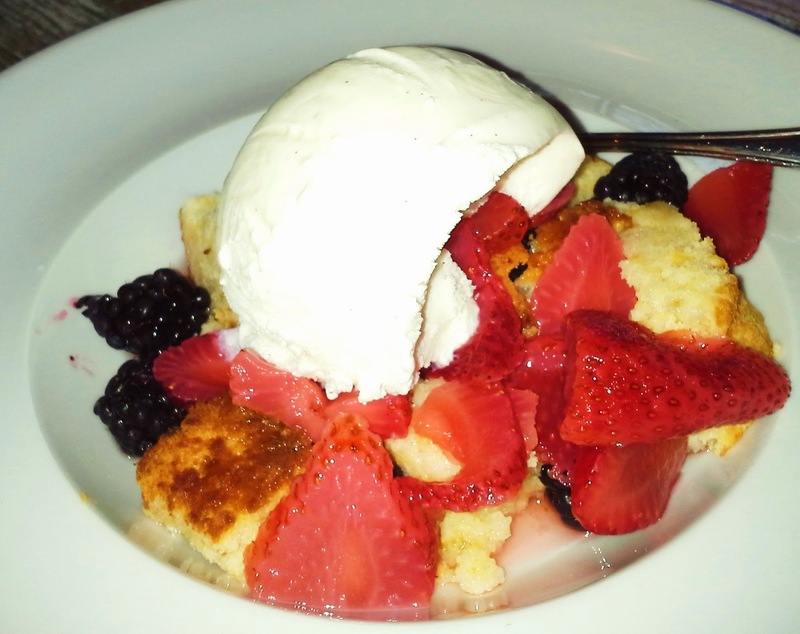 Therefore, we walked a block over to Tin Roof Kitchen and shared desserts including chocolate cake, caramel sea salt panna cotta, apricot pound cake and berry cobbler. I can't think of a more perfect way to end our night at the Food Truck Alley event in Alpharetta! Before I started using findmeglutenfree.com for dining options in my area, I searched Urbanspoon and Yelp! 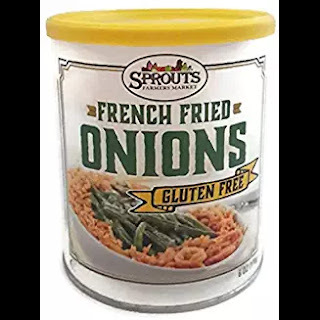 The latter sites are not completely accurate (for gluten-free info) from my perspective, but one listing on one of those sites turned out to be a real gem. christophe's to go is a prepared food kitchen that has many gluten-free options. Since I love to cook these days, I haven't tried anything except for dessert. There are three locations in the metro Atlanta area. To find gluten-free dishes, check the gluten-free box on the left side of the menu page. If you live in the metro Atlanta area and have to follow a gluten-free diet, there isn't much to complain about. Obviously, the initial shock of being told you have to stop eating the way you have all your life and learn how to eat gluten-free is daunting. But these days, it's easier than ever to treat yourself during that trying project - and for long after you've accomplished it as well! I can't name everything I've found to be insanely delicious in the ATL (that could fill a book! ), but here are a few of my absolutely fave finds. Cheese straws from Marilyn's gluten-free. I get these at Whole Foods and ship them as gifts from the website. Warning: these are one of the most addictive indulgences I've come across in a long while! Pound cake from Sally's Gluten Free Bakery. Topping this old fashioned pound cake with fresh strawberries (marinated in sugar and almond extract) and whipped cream will rock your world! Cinnamon scones and cheese biscuits from Gluten-Free Cutie. Both items freeze well so I order them by the dozen, especially for the holidays! NEW! hamburger buns and bread from Pure Knead. If you like soft white bread and buns that do not need to be heated, toasted or altered in any way, check out this fabulous new bread! Rolling out to many Kroger stores presently and the new hot dog bun (not available retail currently) is hitting the gluten-free cart at Turner Field soon. *These two new items from Pure Knead are also egg-free, but you'd never know it by the taste! Pizza and Cheesy Bread at Blue Moon Pizza. I used to try new gluten-free pizza options around town and after being thoroughly unimpressed (or disgusted) with various crusts, I finally stopped. Like my Grandmother used to say "once you've had the best, why try the rest?" The pizza at Blue Moon ranks among the best gluten-free options in NYC! Linguini from RP's Pasta. Several Whole Foods carry some gluten-free products from this incredible line. I've been known to buy every package at the Whole Foods where I shop because they are often out of stock for weeks on end. Hand down my favorite fresh gluten-free pasta! Let's talk about gluten-free fritters! Tiffany is a gluten-free advocate who loves eating out and traveling - safely gluten-free, of course! She simply could not accept that fact that living gluten-free meant living fun-free, as so many others told her it did. Thankfully, the naysayers were wrong a decade ago, and following a gluten-free diet has never been easier than it is now!